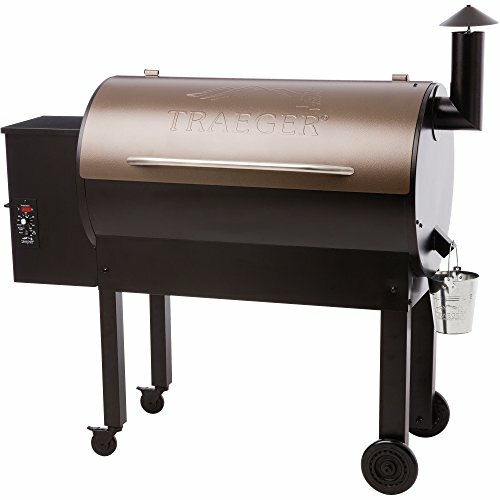 The Traeger brand of grills was founded in Oregon in the 1990s. Since then, it has rapidly gained reputation for its innovative and durable grills. 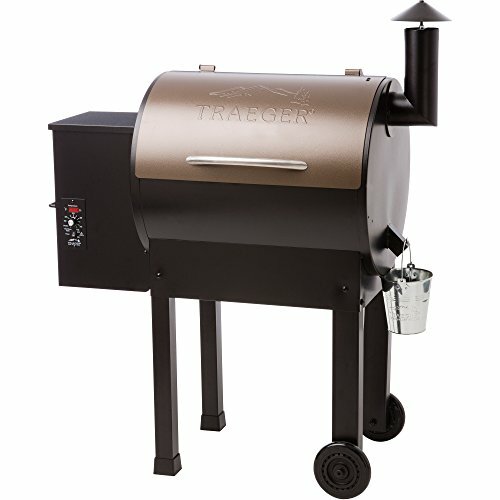 Traeger takes pride in producing the unique taste of juicy, wood-fired barbecue that can only be obtained by burning hardwood. 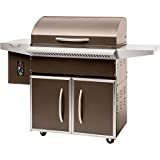 Its grills are famous for their ease-of-use and consistency, living up to the Traeger Promise: “Set It And Forget It”. Traeger grills are made for the taste buds accustomed to charred wood. After all, nothing beats wood-fired barbecue. This product offers versatility, specifically making possible six functionalities: Grill, Smoke, Bake, Roast, Braise, and barbecue. However way you want it, Traeger’s got you covered. Just when you thought grilling was never your forte, a Traeger grill will make you realize otherwise. With its easy-to-use, fun, and advanced technologies, everybody is a pro with a Traeger. 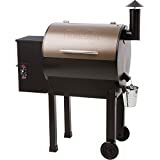 Electronic ignition, temperature control with an LED display, and pellets made with 100% hardwood all combine to give you an exceptionally rich and flavorful dish — the kind that you simply cannot get from an ordinary grill. Make the ordinary taste surprisingly authentic and exquisite. Trigger the excitement of outdoor cooking with a Traeger. How do I know which Traeger grill is right for me? How much food do you plan to cook? What is it constructed of? Do you need the pellet grill to be portable? Best Traeger grill for home: The Select Elite Wood Pellet Grill is just as versatile the Lil Tex Elite or any other Traeger grill. It also features the integrated digital elite controller and a porcelain grill grate. And, of course, it performs just as great as the Lil Tex Elite. But that’s not all this Traeger Grill can do. The Select Elite features 589 square inches of cooking space that can fit up to 20 burgers or 6 racks of ribs. It also features an enclosed storage space that lets you store bags of pellets for future barbecue sessions as well as any other accessories you want to keep close at hand. In addition, you get two side shelves for extra prep space. Wheels with locking casters let you roll your pellet grill to where you need it and keep it there. However, assembling this pellet grill is very time-consuming. Also, the max temperature that this grill can reach is 450 degrees while other brands can reach 700 degrees. If the Lil Tex Elite is not big enough to feed your horde, then you can get the upgraded version – the Texas Elite 34. This pellet grill can comfortably feed your entire family and some neighbors too. It has 646 square inches of cooking space which is large enough to cook 9 racks of ribs! Aside from the size, another difference between the two is the presence of 4 wheels plus locking casters. While this unit is heavier (125 lbs vs 98 lbs), it is much easier to transport from the garage and back. And the locking casters ensure that it won’t be running away with your food anytime soon. The rest of the features between the two remain the same such as porcelain cooking grates, the digital elite controller, electronic auto-start ignition, and durable steel construction. However, this grill doesn’t come with a temperature probe like the PRO model. It is also a bit difficult to switch pellets. Best traeger grill for the money: The Lil Tex Elite is a versatile cooking machine. You can grill, smoke, roast, braise, barbecue, and bake food on this baby. In short, you can cook an entire meal using just this wood pellet grill. This grill features 418 square inches of cooking space that can cook 16 burgers or 5 racks of ribs at the same time. If you need more space, the Lil Tex also comes in a larger size – the Lil Tex Elite 34. The porcelain grill grates are great at heat retention and easy to clean. There’s an integrated digital elite controller that allows you to easily set up the pellet grill. It features an LED display that allows you to easily read the temperature inside the grill at a glance. The steel construction ensures that you’ll be enjoying cooked meals on this grill for years to come. However, the pellet grill is quite expensive. The instructions that come with the grill are poorly written. And it is very heavy. One of the smallest Traeger grills, the Bronson 20 grill features 300 square inches of cooking space which can fit around 12 burgers or 3 racks of ribs. An integrated Digital Elite Controller makes setting the temp easy, going all the way up to 459 degrees. The LED display allows you to check the temp at a glance.The sawhorse design provides the grill with stability while the all-terrain wheels plus the side handle enables you to transport your grill from the garage to the patio and back again without breaking a sweat. And because it has no open flame, this little pellet grill is HOA-approved. However, the hopper capacity is also smaller compared to other models at only 10lbs. Also, it is made in China which may not be to everyone’s liking. 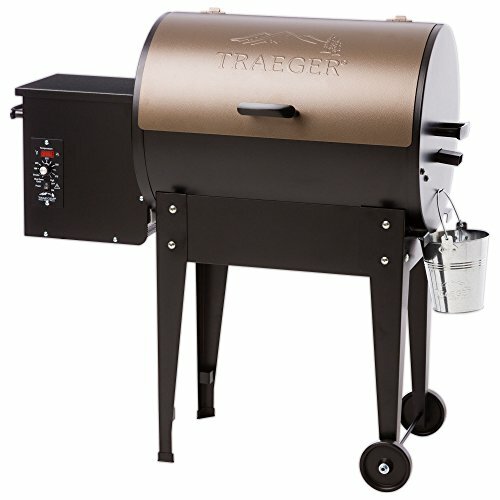 Best Traeger grill for the beginners: Another small Traeger grill but not one lacking in performance. This little baby may only have 300 square inches of cooking space and an 8lb-hopper capacity but it can definitely deliver a delicious wood-fired barbecue taste in every meal. This pellet grill only weighs 60lbs. Aside from being lightweight, it features two wheels and a side handle so you’re more easily able to transport it from a tailgate party to a beachside barbecue. 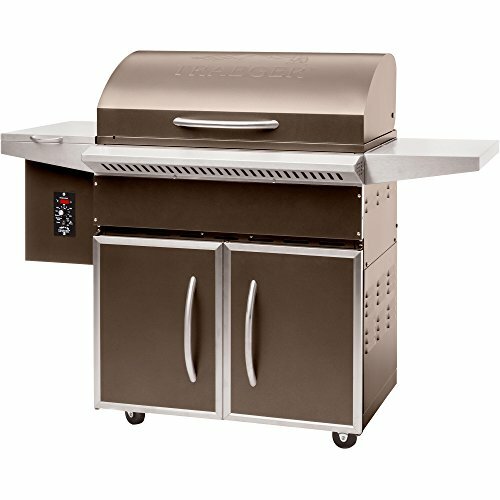 Also, while it is small, the grill still has most of the features seen in bigger models such as the digital elite controller, porcelain grill grates, steel construction with powder coat finish, and an electronic auto-start ignition. However, this is a very short grill so it might not be ideal for really tall individuals. The small hopper capacity means more frequent refilling if you plan to do a couple of rounds of cooking at a time, like a barbecue party. And it is quite expensive for such a small size. Perfect size for a small household or for tagging along for remote camping. 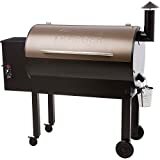 The Traeger Grills TFB38TCA Renegade Elite Wood Pellet Grill has several features that make it stand out from other Traeger grills in the market. This versatile grill features a tool caddy rack where you can store any sauces and rubs for easy access as well as any grilling tools that you want to keep on hand. It also comes with a wire front prep rack. This unique rack enables you to easily load and unload your grill; instead of a side shelf, you can use the rack to prep and test your meats as well as rest them after cooking before you start serving the meal. This is incredibly convenient if you’re cooking quite a lot of food on your grill. Of course, like most Traeger grills, this one also features an electronic auto-start ignition, porcelain grill grates, and a digital elite controller. The Renegade Elite Wood Pellet also comes with two large wheels for easy transport. One thing to take note is that the grill is quite small – only 380 square inches of cooking space. And this particular model has been discontinued (though you can still purchase it from reputable sellers online. Grilling area: 20 in. x 19 in. Cook however way you want your dishes done. The best part is that every unit of Traeger is built to withstand any type of weather. Every part is built to last — so you can enjoy delicious, wood-fired grill and keep doing it like a pro in the years to come. There’s nothing like the taste and flavor you get from food cooked over wood. It’s probably why Americans love grilling so much. Of course, charcoal grilling is an art that takes practice to perfect. For those who aren’t ready to take on the challenge of charcoal, there’s one grill that should be right up your alley – the Traeger Grill. Long before pellet grills were introduced in the market, there were pellet stoves. Traeger, a manufacturer of pellet stoves, decided to expand its business in 1982. They invented the very first wood pellet grill and has since become a leading brand in the market. Wood pellets from the hopper are fed into a fire pot by a feeding mechanism such as an auger. An igniter rod lights up the pellets inside the fire pot when you turn on the grill. A fan then blows air at the fire, stoking it and spreading the heat as well as smoke inside the cooking chamber. A digital controller in the pellet grill allows you to set your desired temperature. The set temperature controls the rate of feed – how many pellets are fed into the fire pot over a period of time. The lower the temperature, the slower the feed rate of the pellet grill. There are several questions you need to ask yourself when choosing the right Traeger grill or any wood pellet grill for that matter. We’ve listed the important questions below to help you make the best choice possible to suit your grilling needs. When you choose a grill, any grill, you have to first consider how many mouths you want to feed. 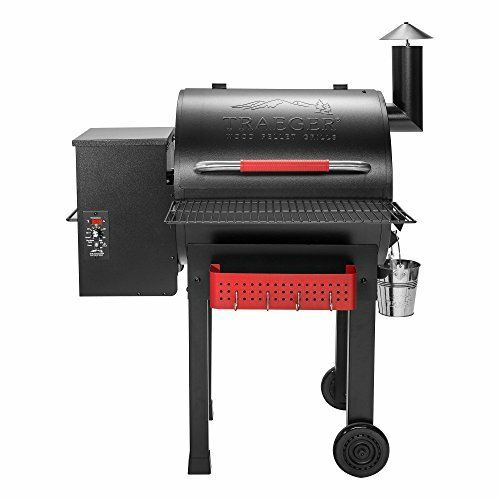 Small pellet grills like the Traeger TFB29LZA Junior Elite Pellet Grill features 300 square inches of cooking space which can fit around 3 racks of ribs. The Traeger TFB65LZBC Texas Elite 34, on the other hand, is more than double the size with 646 square inches of cooking space. If you only plan on cooking for your family or a small group of friends, a small Traeger grill may be just the thing. A bigger group will require you to get a bigger grill. On another note, you’ll also need to consider the space available in your backyard/patio when choosing size. As we’ve already mentioned, Traeger grills feature a temperature controller. Ideally, it should be easy to use. An LCD display enables you to see the current temperature inside the cooking chamber. The range of the temperature should be between 180 degrees Fahrenheit to 425 degrees Fahrenheit. When choosing a Traeger grill, you’ll notice that there are three different temperature controllers used. The Digital Elite Controller that you’ll find in many Traeger grills such as the Traeger TFB42LZBC Grills Lil Tex Elite is very easy to use. It’s also the most basic temperature controller available. It features a knob that you turn to set the temperature, an electronic auto-start ignition for easy startup, and an LCD display. Higher-end models have additional features such as integrated dual meat probes and a timer. 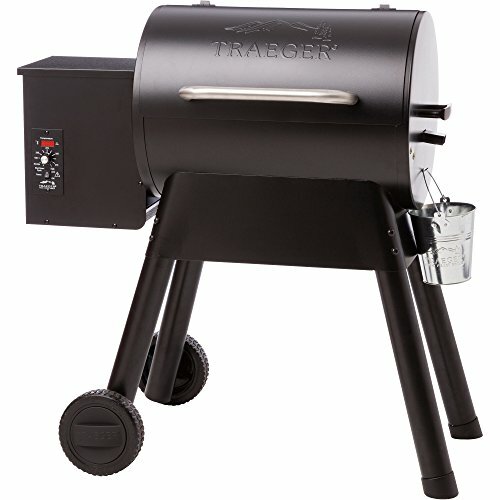 The best pellet grills are made of painted steel for durability like all Traeger grills are. A powder coating is necessary in order to ensure that the grill won’t rust and protect it from extreme weather conditions. A Traeger grill is not something that you can store outside. It is, after all, an electrical appliance. In addition, the pellets cannot get wet. Wet pellets expand and can cause the auger to become clogged. Plus, you can’t really light up wet wood. Since you aren’t going to be cooking on the grill inside your garage, you’re going to have move it around before and after cooking. You’ll need to make sure that the Traeger grill you get is portable. Now, all of the models feature wheels for this very reason. The bigger models such as the Traeger Select Elite Grill feature four wheels with locking casters. Smaller ones like the Traeger Grills TFB38TCA Renegade Elite Wood Pellet Grill only feature two wheels but it also comes with a side handle to make it more easy to push around. However, not all Traeger grills are ideal for tailgating or beach parties despite the presence of wheels with the exception of the Traeger TFB29LZA Junior Elite Pellet Grill. The final say in your choice of a Traeger grill may all come down to price. Since the brand is a leader in the market, it’s not unusual that it comes with a slightly steeper price compared to other models. If you’re a beginner who wants to try outdoor cooking using a pellet grill, the Traeger TFB29PLB Grills Bronson 20 Wood Pellet Grill is the most affordable. Bigger models naturally cost several hundred dollars more though they also have more features. It’s important to balance your needs with the dollars in your wallet.